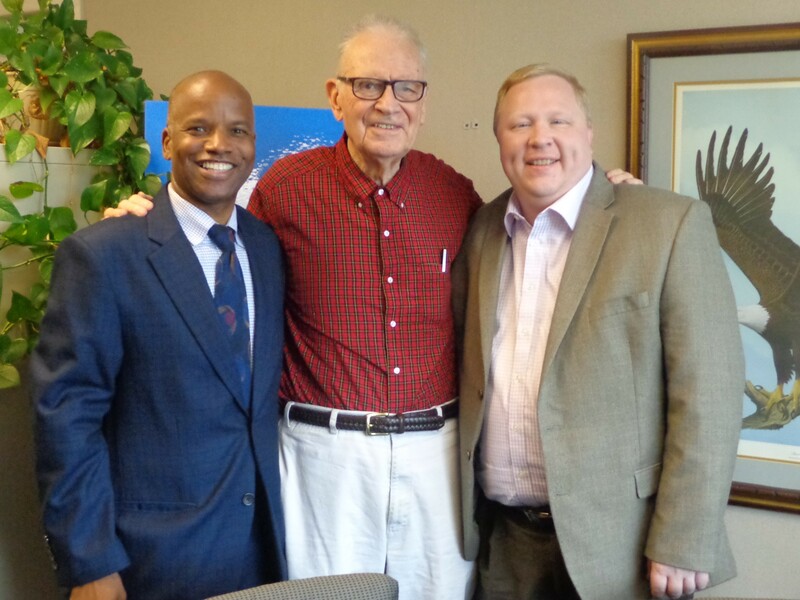 Yesterday I had the honor to meet with Lee Hamilton, former Congressman from Indiana and Co-Chair of the 9-11 Commission. We talked about a range of issues, most notably Guantanamo Bay and the work being done by the Military Commission Observation Project of Indiana University McKinney School of Law. Our meeting, that was arranged by Mr. Chuck Dunlap of the Indiana Bar Foundation, happened to take place four days after the U.S. swapped five Guantanamo Bay prisoners for Bowe Bergdahl, a U.S. soldier who had been held captive by the Taliban for five years. It was also the day after the Pentagon announced that charges were being formalized in a Guantanamo Bay case against another accused, Abd al Hadi al Iraqi, a former CIA prisoner who is alleged to have been a high-ranking al Qaeda arrived at Guantánamo in 2007 who allegedly killed Canadians and U.S. soldiers. Echoed throughout our hour-long discussion with Congressman Hamilton were the concepts of due process and fairness. I concluded that Congressman Hamilton believes that fairness and due process should guide the U.S. Government through every step of the Guantanamo Bay Military Commissions. Not only should the Military Commissions be fair, but also the proceedings should appear to be fair. Due process should be provided to all. Transparency is critically important. Furthermore, I concluded that he believes that independent monitors like our MCOP participants should approach their jobs with open minds, and should be prepared to report not only any deficiencies spotted within the Commissions, but also to report any commendable aspects of the Commissions. I shared with the Congressman my belief that regarding the Military Commissions, all stakeholders have the right to a fair trial. The accused are stakeholders, and they have the right to a fair trial. The prosecution, which represents we the people, are stakeholders, and they have the right to a fair trial. The victims and the families of the victims are also stakeholders and they have the right to a fair trial. Military Commission Observation Project participants have an obligation to monitor the proceedings, and to ascertain based on the law and the facts whether we believe all stakeholders are being provided with their fair trial rights. That is, we as monitors draw conclusions as to whether we believe the proceedings are complying with U.S. and international law, or whether the proceedings are not complying with U.S. and international law. It was a delight to hear Congressman Hamilton share stories from his law practice days (including when Indiana had “paupers’ attorneys”), his many years in Congress, and his Co-Chairmanship of the 9-11 Commission. I look forward to visiting with Congressman Hamilton again, perhaps after my next visit to Guantanamo Bay, which is scheduled for the week of 16 – 20 June 2014. I am scheduled to monitor hearings in the case of Khalid Shaik Mohammad and others accused of masterminding the 9-11 attacks on the World Trade Center and Pentagon, and to monitor the arraignment of Abd al Hadi al Iraqi, the latest Guantanamo prisoner to be approved for trial.